Disclosure: This post was underwritten by The Chattanoogan. All text and opinions are my own. My oldest daughter turned 13 just a couple of weeks ago, and I knew we wanted to do something special for her since 13 is an enormous deal. 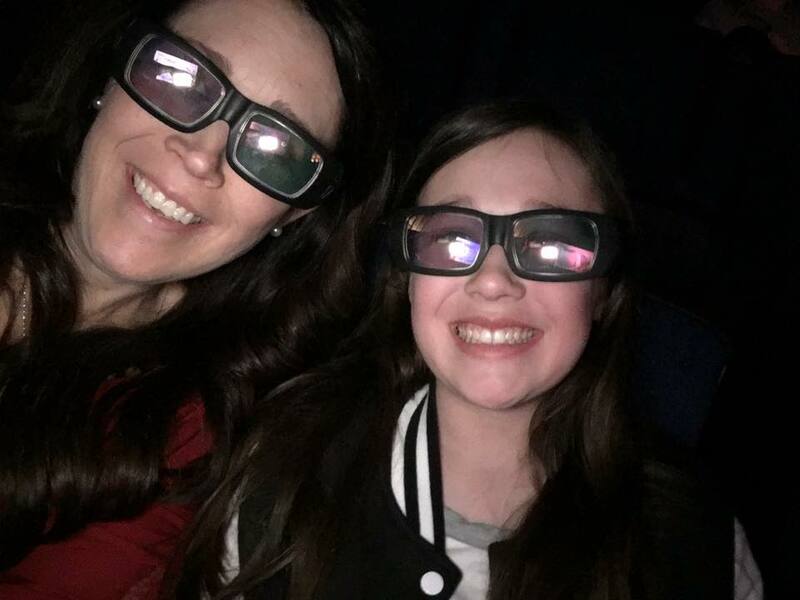 Several years ago we stopped throwing “friend” birthday parties for our kids and instead began to invest in creating memories and experiences together. For my son’s birthday this year we went to Dollywood and Dollywood Splash Country, but since I am having a baby in just a few weeks I knew we wouldn’t be able to go far or do very much. 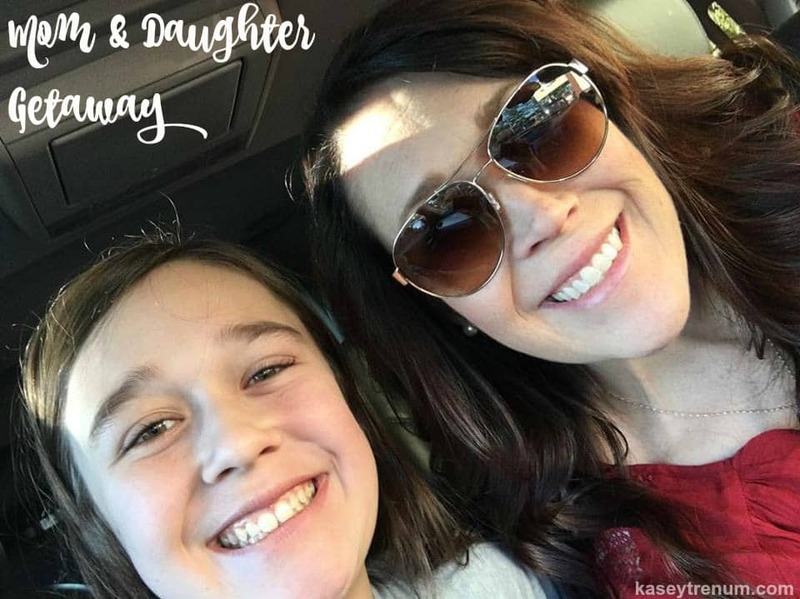 But at an age when many girls start to pull away from their moms, my husband and I want to be very intentional to invest in her heart and let her know how special she is to us. Plus, five years is all we have left before she is legally an adult. This is why I wanted to take her away for the night for her birthday despite being 36 weeks pregnant and so very uncomfortable. I wanted to spend one on one time with her because I know in the coming years she is going to spread her wings to fly alone. The process, while necessary, won’t be easy for us. However, it’s up to us as her parents to invest in her heart and our relationship now. 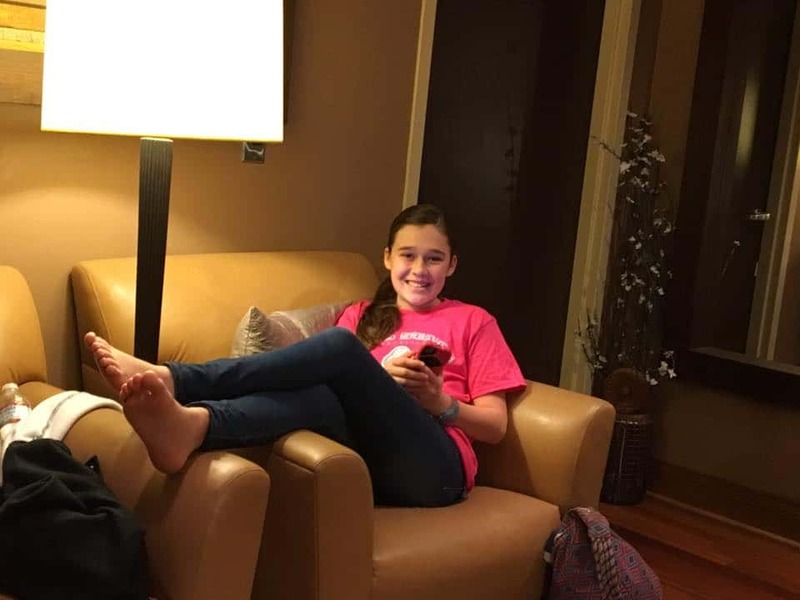 Her 13th birthday was a chance I didn’t want to miss, and I knew it could be something she would remember the rest of her life. In saying all that, my husband and I felt that a mom/daughter night away would be best. Morgan’s love language is time and individual attention. This would give me a chance to spend focused time with her and fill her love tank full before her new baby sister is born. After thinking about where we should go, we decided on The Chattanoogan in Chattanooga, TN since it’s close by and well known for having luxurious accommodations. I wanted to treat her like a big girl and plan a getaway that would blow her socks off. Also, The Chattanoogan has a spa, which would be something we could enjoy together and it wouldn’t be too taxing on me this far along in my pregnancy. Since most of our getaway would be spent at the hotel, I wanted to make sure we picked somewhere really nice especially now that she is getting older. This was our first trip to The Chattanoogan. We were greeted with a charming lobby all decorated for Christmas and a warm fire burning in the fireplace to set the ambiance. When we checked in the hotel, one of the gentlemen behind the counter greeted Morgan with, “Happy Birthday! I hope you enjoy your stay. You guys have dinner reservations tonight, don’t you?” This was just the beginning of so many people working together to make her feel special. Once we were in our room, I was very impressed with the cleanliness, which is super important in my book. Our room was well appointed, and there were surprises awaiting us. 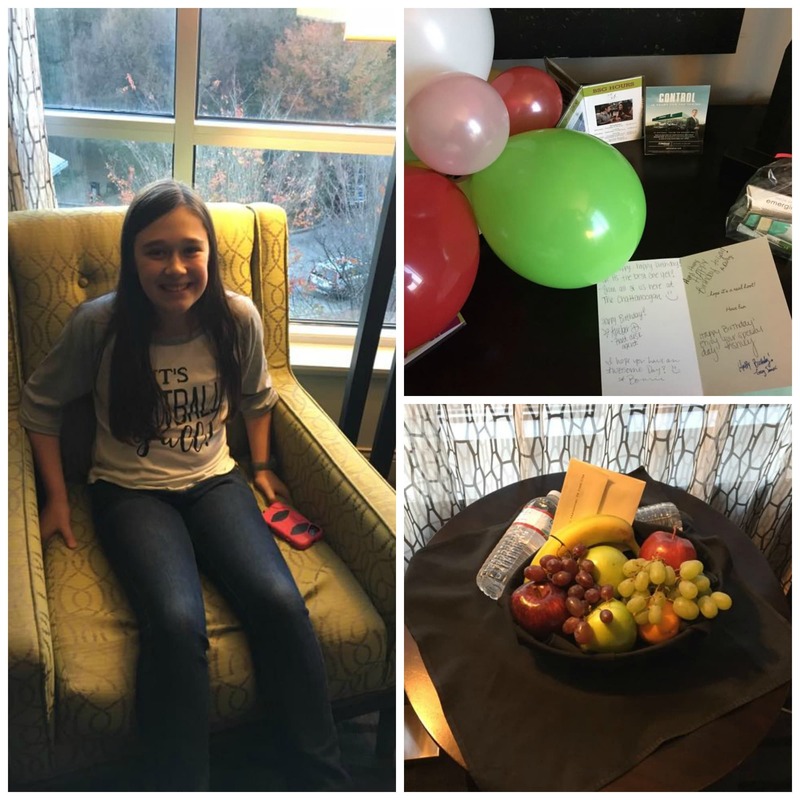 First, balloons and a birthday card signed by the hotel staff and a fruit bowl with bottled water. We freshened up and walked down to dinner at The Broad Street Grille, which is located inside the hotel. We had made reservations ahead of time, and they knew about her peanut and tree nut allergies. However, I was blown away at the personal treatment we received. First, as the host showed us to our table, I noticed a gift, balloons, and flowers waiting for her. I can’t tell you just how much this impressed me! Next, the chef came out and personally introduced himself to us. He gave us a choice of ordering off the menu, or we could make a personal selection of our choosing.This was a first for both of us. I don’t think I’ve ever had a chef at a restaurant come out and introduce himself. We decided to be fancy and make a personal selection based off some of our favorite items on the menu. We each ordered a garden salad along with steak and mashed potatoes. It’s hard to tell by the picture, but we both decided it was the best meal we had ever tasted in our entire lives. 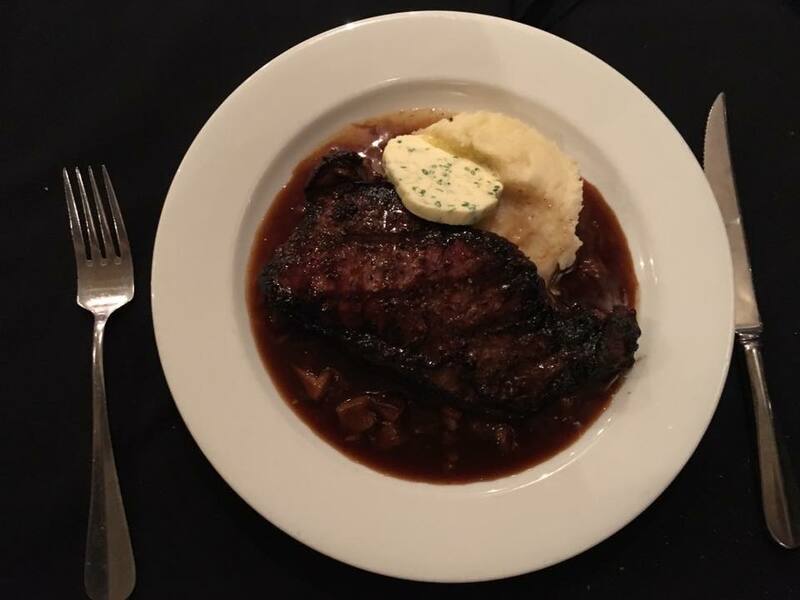 The steak was cooked perfectly as we asked and the mashed potatoes were so rich and creamy. I don’t even know what kind of gravy or sauce was on the steak, but it was incredible too. Between the homemade bread, salad, and the main course we stuffed ourselves full. I was not expecting dessert because of my daughter’s peanut and tree nut allergies. It is a rarity for us to order dessert out and that is only after asking a million questions about the ingredients before saying yes. Most of the time it’s just not worth it because we know she will end up disappointed. Then, if we go to a youth event or homeschool community meal, I always make a dessert, so we know that it’s safe. When the chef came out to let me know he was making a special dessert just for her that was not on the menu but completely safe, I wanted to cry. Morgan has so many food restrictions with her being a type I diabetic and having severe allergies that we just aren’t used to a restaurant taking the time to cater to her specific needs. If you are an allergy mom, you know how this made me feel. 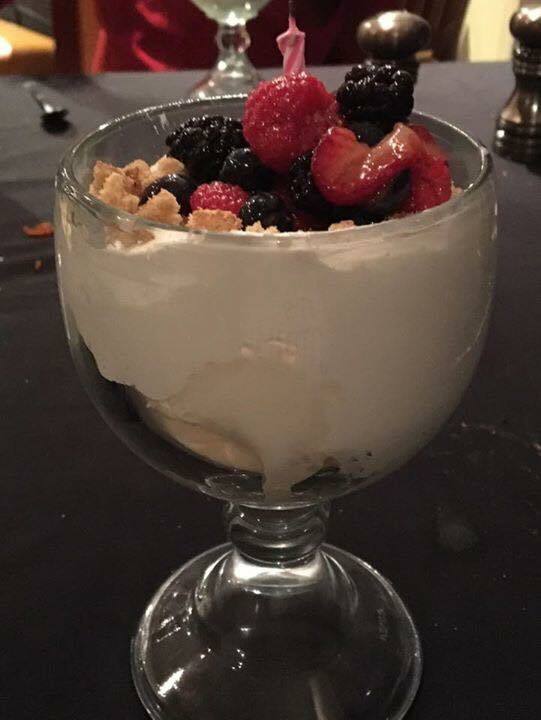 Her special dessert was vanilla ice cream topped with a fruit medley, crumbled cinnamon thins, and fresh whipped topping. Despite the fact that we were already beyond full we devoured our dessert. It was fantastic!! I wish I would have gotten a photo with Morgan and the chef together. 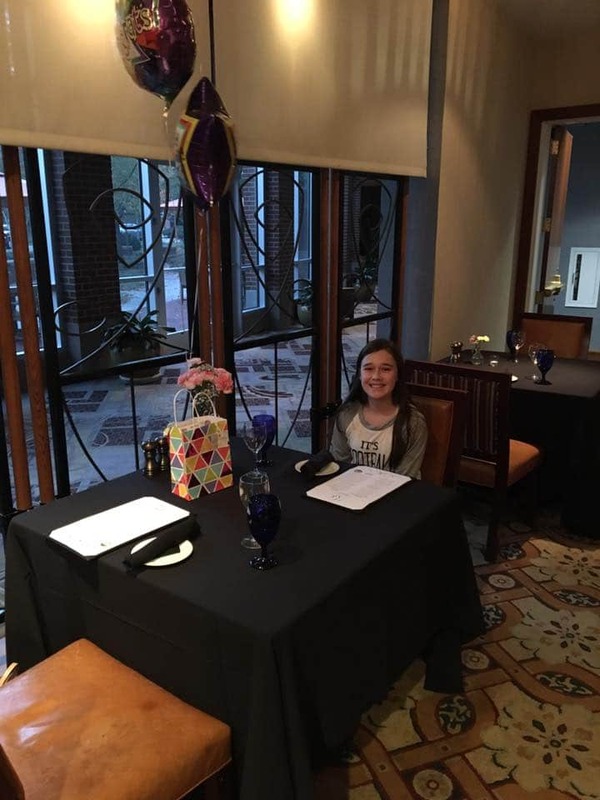 It was such a special birthday dinner for her. The extra steps that The Broad Street Grille took to ensure it was a special night did not go unnoticed. She said she felt like a celebrity. After dinner, we headed out to the IMAX theater in downtown Chattanooga to watch Jerusalem. It was my first time at the IMAX. I enjoyed the movie. It was so cool on such a large screen. We both enjoyed the history and different perspectives of life in Jerusalem. 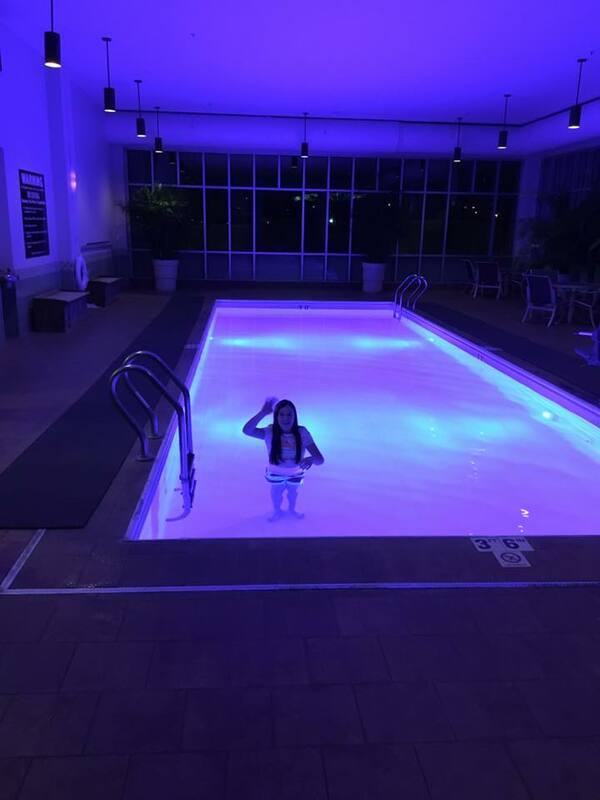 Once we got back to the hotel, it was getting late, but since we didn’t have to be up early the next morning, we decided to take a dip in the indoor pool. Plus, my baby is still breech, and my OB had mentioned that swimming might help her turn. We both did lots of handstands in the pool, hoping it would encourage the baby to turn. It didn’t work, but we still had a very good time. 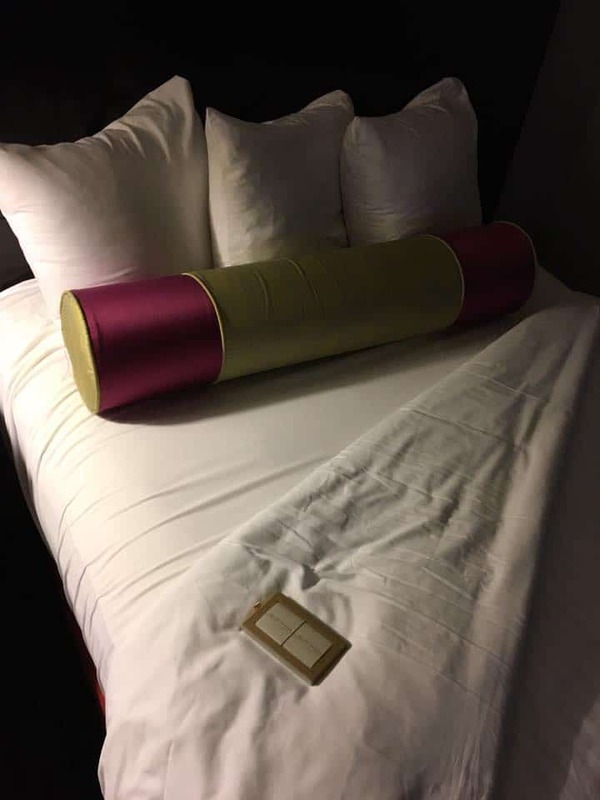 Besides a cruise years ago, I’ve never had a hotel turn down my covers and leave chocolates. I texted this picture to my husband, which he promptly replied, “I’m going to sprinkle chocolate chips in our bed, so I’ll feel special too.” His quick wit makes me laugh so much! After a long full evening, we were both ready for bed after we face timed my hubby to give him all the details of our fun night, especially our custom dessert. 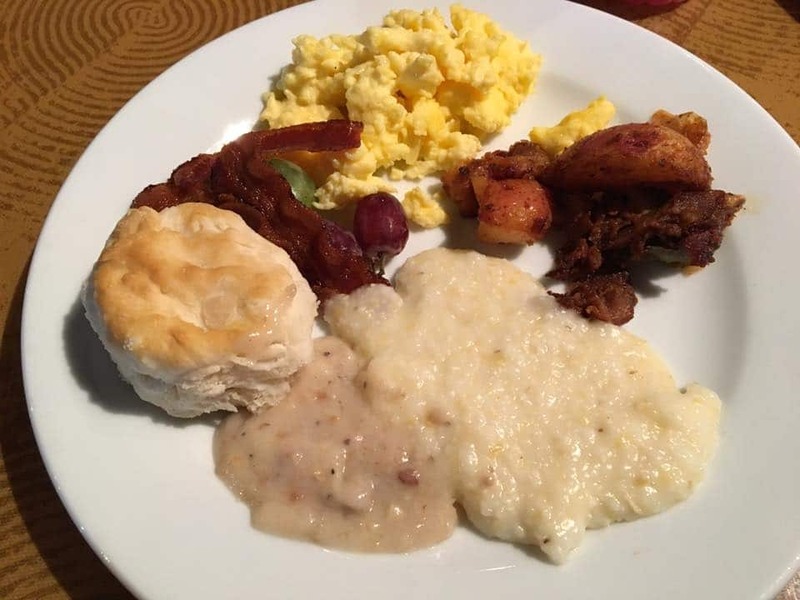 We enjoyed the buffet breakfast the next morning at the Broad Street Grille since it would be so easy just to run downstairs before our spa appointments. There was a large variety of fresh food on the buffet, or you could request any kind of omelet you wanted. Since there were several people waiting for a homemade omelet, and our spa appointment was calling our names we opted out and just stuck with the yummy buffet. When we walked in the spa, they immediately greeted my birthday girl and wished her happy birthday. Also, they took her peanut and tree nut allergies very seriously. The kind lady who took care of our pedicures had read through all the ingredients in the supplies she would use for her pedicure and replaced any items that included almond extract as an ingredient (without me even having to ask)! I don’t know when it happened, but all of the sudden my first born baby girl no longer looks like a little girl. 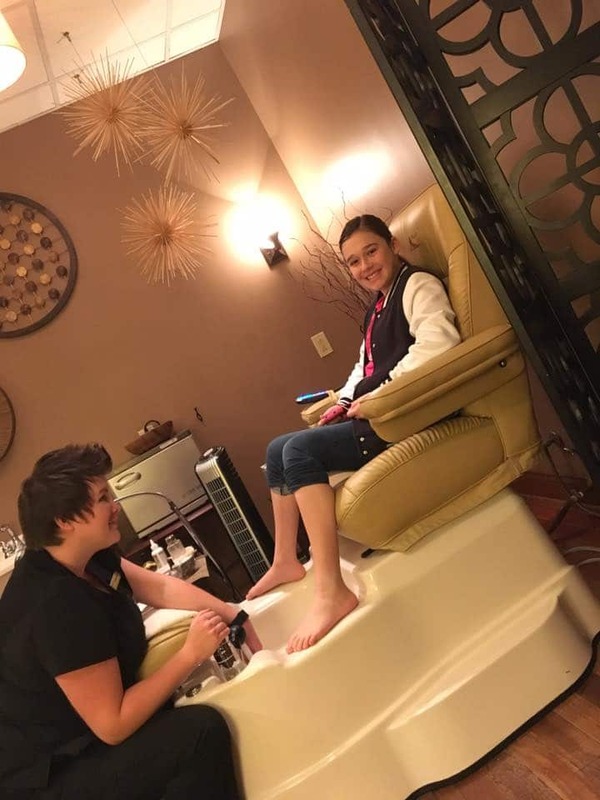 As I sat there watching her get her toes done all the while giggling all I could think about was how fast the years have flown. Just yesterday we were bringing her home from the hospital, now she’s practically a young woman. This is my sweet Morgan. She is laid back and comfy letting her toes dry while I’m getting my pedicure. She’s so much like me in so many ways. Organization doesn’t come easy for us. If you could see all around her, there was stuff all over the floor. Her bag, water bottle, shoes, socks just were thrown around with no rhyme or reason. I try so hard to be neat and have to work hard and be intentional otherwise everything in my world would look the same way. I’m glad I understand how her mind works. 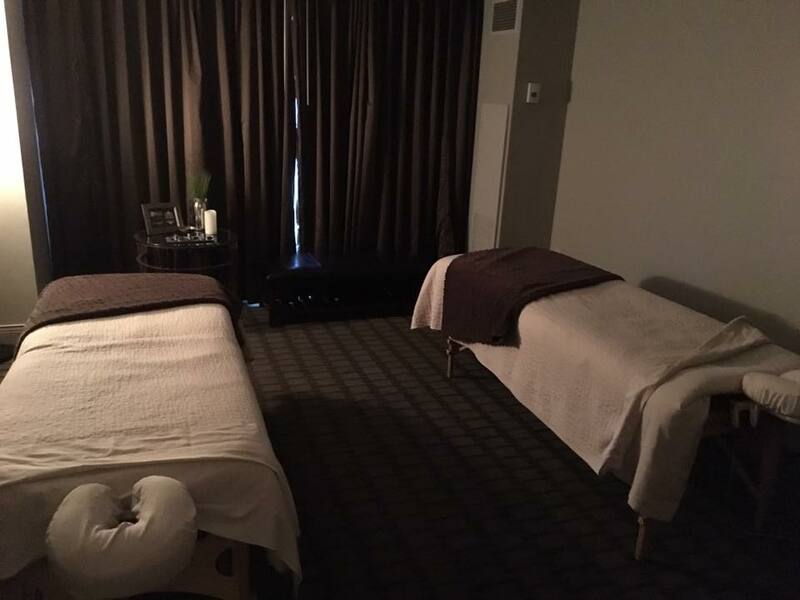 Our final spa treatment was a mini massage in the couples suite. I probably should have explained to her how a massage works because the only massage she had ever gotten previously was a chair massage out in the middle of the mall. The look on her face when the lady told her she could undress to however she felt comfortable was priceless. Bless her heart; I am shocked she didn’t run out at that very moment. I quickly explained what she meant, and she felt better. I’m not sure she needed the massage as much as I did because she took selfies of her face squished in the pillow and texted them to her brother during the massage. I, on the other hand, fell fast asleep. It was glorious. After our last spa treatment, we checked out of the hotel and enjoyed lunch at Taco Mac before going Christmas shopping together. The finale to our big night out was a biggie! 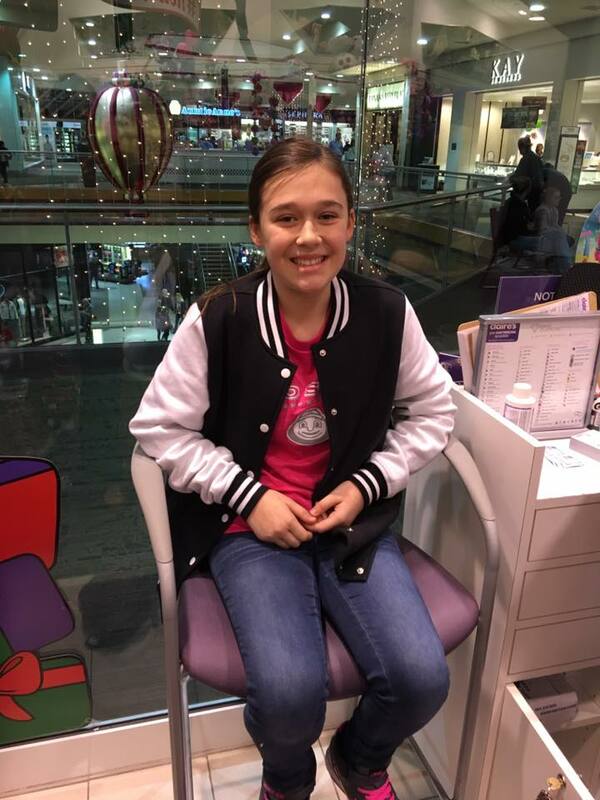 After thinking about it and talking about it and thinking about it and talking about it, Morgan decided that today was the big day for her to get her ears pierced. She couldn’t wait to surprise her daddy and brother. I was so proud of her for being brave as I knew she had been reluctant for a while. All in all, we had such a wonderful time together. Although it’s not easy to watch her grow up, I am truly enjoying this season of life. It’s so fun to be able to have adult-like conversations and share experiences that we both enjoy together. I couldn’t have been more pleased with our experience at The Chattanoogan, The Broad Street Grille, and the Spa at The Chattanoogan. They went above and beyond to make our trip memorable and extraordinary. We made memories together that will last a lifetime, and she will never forget her 13th birthday. I can’t wait to go back with my husband. Our 20th anniversary is at the end of December. I think we might need to go for a night away and dinner to celebrate. I hope that by sharing our trip I have inspired you to collect memories and experiences with those you love and not things. We save all through the year so that we can do something special on birthdays. Plus, we don’t spend money on parties, instead we invest in our kid’s hearts. Thank you so much. Daughters are an incredible blessing. I am so sorry for your health issues. I pray you will experience incredible healing and restoration. Blessings to you.